Brakes Scotland has launched its 2017 brochure of Scottish food. Celebrating the best produce from all over Scotland, the new brochure showcases the company’s extensive range of over 400 products from 60 local Scottish suppliers. ‘This is our most comprehensive Scottish brochure to date,’ commented Operations Director, John McLintock. ‘Since the creation of Brakes Scotland we’ve been working with a wide range of Scottish suppliers, both new and existing, to help grow and develop our portfolio. From starters to deserts and everything in between, I believe we now offer caterers the broadest range available, in whichever sector they operate. Meanwhile, favourites such as popcorn, Mackie’s crisps, Stornoway Water Biscuits, Deans Shortbread, Stoats Porridge Oat Bars and the award-winning Mrs Tilly’s Scottish Tablet are also featured within the brochure. 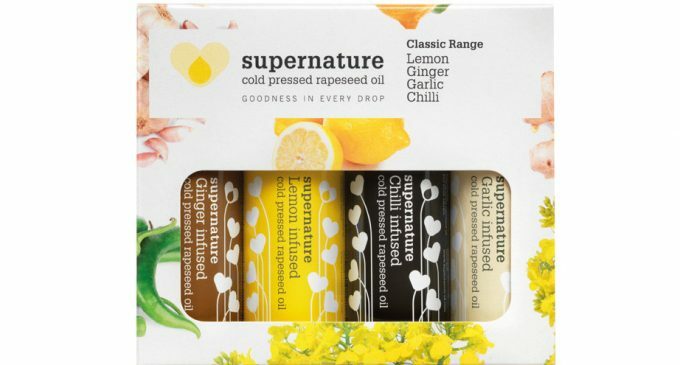 However, it is perhaps the selection of cooking oils – including the award-winning Supernature rapeseed oils (pictured) that really add to the line-up. Made just south of Edinburgh, the oils are infused with various natural ingredients to make it easier for chefs to enhance their dishes. From garlic and lemongrass to mint, chili, coriander, ginger and both white and black truffle – in addition to many others – there is a product to suit most recipes.